In recent years, smart phones and tablets have changed pretty much everything around us and how we do the things we do. The realm of music and worship leading is no exception to this. Since the very first release of the iPad, there have been apps hitting the scene for displaying your music, which could of course be used in any scenario that you play music. A handful of such apps have become popular over the years for use while leading worship or playing in your church worship band. One of those apps is Power Music. Power Music is much more than just a music display system. 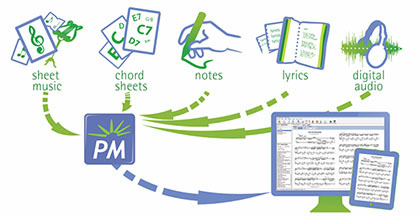 It gives you total control over your music collection - sheet music and chord charts. This popular app is made by UK-based Power Music Software and comes with desktop versions for both Windows and Mac, but also has the iOS version for iPad and iPhone. Then using their Power Music Box solution, you can store your music in the cloud and transfer songs between devices and the different PM solutions. NOTE: The iPhone version of the app is "Power Music Reader". While it does not have the full capabilities of the iPad app, it is FREE and will allow you to import the WorshipReady charts into your iPhone! On February 11, 2019, Power Music released a new version of their iOS apps that includes a full integration with our WorshipReady chord chart service! Within the app, you can go to add a song and choose WorshipReady as the source. Then you will enter your WR login credentials and gain access to all available chord charts. Search and find the chart you need and import it right into the app! It doesn't get any easier than that! You already know that WorshipReady charts are the most accurate charts available from anywhere, and now you can pull them right into your favorite PM solution. Once the chart is in the app, you can do key changes, edits, etc, using all of the great app features. No PDF files here that leave you with a static chart that you can't do anything but look at! Also, if you use PM on Windows or Mac, once you have imported the WorshipReady chart onto your iOS device, you can use the Power Music Box to transfer that chart to your computer if needed. Now, time to stop reading and go to your App Store to get Power Music today!